Accept Conflicts as part of life. Many people shy away from conflict both in their personal and business lives. Instead accept conflicts as part of your life. When personalities meet they will have different opinions and different views. Only by passionately defending your views and exchanging views with others will your views develop and will you get to deeper insights in the issue at hand. Life is full of contradictions, Hot and Cold, Big and Small, Yin and Yen, War and Peace, Go and Stop, Forward and Backward. You will not live your life to the fullest if you avoid exploring both and either stay on one side or try to balance safely in the middle. We should not shy away for conflict. Conflict is healthy, or can be healthy. For most people it is difficult to see that conflict is just part of your everyday healthy business life and career. The point is that you need to learn how to deal with it effectively. There are many books written about conflict handling and I encourage you to take at least one and read it. Here I want to go over some basic concepts and share some of my experience. A first concept is to choose your battles wisely. When you run around your work place with a short fuse and start arguing about every small little details that you have an opinion about, you will bore or worst agitate your co-workers or associates and it will hamper productivity. 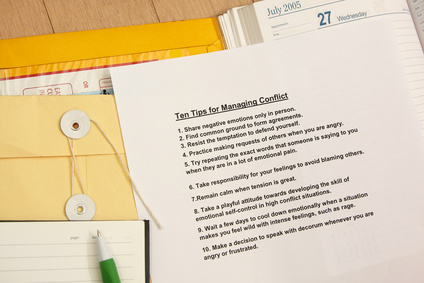 Ten tips for managing conflict concept for management improvement. Always understand the conflict first before engaging in it. The number one cause of conflicts in the company is lack of goal clarity or clarity of who does what, or is supposed to do what. People get annoyed when others seem to either interfere in their jurisdiction or don’t seem to help at all, with the projects at hand. Check it out, someone or all of them maybe confused about priorities, task division or ultimate goals to serve. Who started the conflict is not always immediately clear because the one first talking about it can have been agitated for a long time by someone else not doing something or doing something that first was OK but now has grown to be an issue. The more important point is who all are involved. When you engage in a conflict remember that you are not only talking to the people directly involved in the conflict but also to the usually large population around them who have heard about it and who may be involved later in a similar way. If the conflict doesn’t affect the productivity now or in the future think hard about getting involved. Some people just don’t get along and that is only natural, as long as they are professional about it you shouldn’t care if they invite each other over for coffee or a birthday party, only when the work suffers, you need to start making moves. In my experience the best way to go about conflicts at work has been to discuss and re-emphasize and re-iterate the ultimate goals. This handles a lot of conflicts and chances are that all parties involved learn something. When personalities clash it is good to encourage some closer cooperation maybe in a different setting. Get them involved in a project where their normal office responsibilities not necessarily play a role. People involved in conflict situations tend to ignore all positive news about the other parties and demonize them. It’s a piece of the HORN effect. Once you start encouraging more contact such that they see the other parties in more than one small role, the perspectives may shift. In any case, do not ignore conflict. Engage, don’t let it go, don’t be shy, don’t be intimidated. My experience is that most conflicts if left alone too long will escalate, another observation is that even if the conflict dissolves by itself, your inaction in a difficult situation will be remembered by all people involved. There are lots or resources where you can go for help, some companies have an employee assistance program where you maybe able to refer people to, you can consult with your Human Resources representative or with higher up management.